a light snowfall last night and a sunny day have left highlights of white across the city. i forced myself out of the cozy apartment this afternoon to get some fresh air and say hello to the lake. 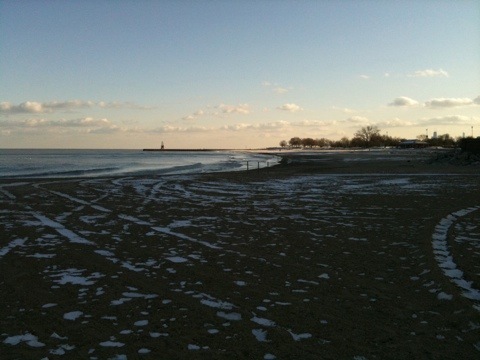 despite a chilly wind the deserted beach was pleasant. sun glinting off snow in gaps between building shadows, gentle waves lapping against the shore, the snow-filled curvature of a tire track, mirroring the arc of the lake’s edge. such a stark contrast to our scene here. The grass is getting greener and greener. Mushrooms are still going bonkers.